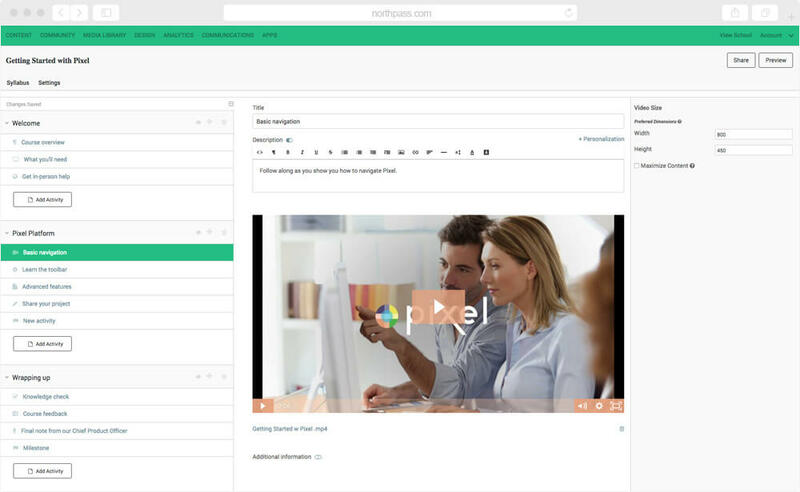 Northpass (formerly SchoolKeep) is an innovative learning management system (LMS) that enables organizations to train employees, customers and channel partners. The solution places the learner in the center of SaaS platform, resulting in a more effective and satisfying learning experiences. With its mission to help managers make training a company competitive advantage, Northpass was looking for a software outsourcing partner, with e-learning development background, to build a new category of learning management system. The solution should enable business professionals with no e-learning expertise to easily create and deliver original online training content that engages learners and improves business outcomes. The software solution should deliver exceptional learning experiences and monitor training metrics. Northpass needed to augment its domestic engineering team with a larger, lower-cost option for a development talent. They needed an outsourcing partner with an ability to scale the team. Selleo augmented the client to boost the platform development and facilitate faster implementation of features. With staff augmentation, the company could adjust to rapidly changing staffing needs and meet aggressive project timelines. This SaaS platform is aimed to provide tools for creation and distribution of training content and allows its users to build and scale branded training experiences. Being used by leading companies such as AirBnB, Uber or Shopify the suite of cloud-based tools facilitates the creation of an online school with a website with custom branding, own curriculum, e-Commerce solutions and more. Northpass offers a modern learning experience with real-time data and reporting together with a powerful single sign-on (SSO) integrations and flexible API and Webhooks. With Northpass, users can efficiently train employees, customers and partners with a single solution. Our developers were responsible for the back-end development with Ruby on Rails and as the front-end part we applied Angular and React with HTML5 / CSS3.